Project BX – HubNut – celebrating the average! Yes, I’ve done it. A sale has been agreed on the Mk1 BX estate. It’s going to a really good home, but I’m still a little sad that project fatigue and a lack of cash have prevented me doing more with it. I shouldn’t complain really. I got the car recommissioned and back on the road and working well enough to pick up two show awards! Ok, they were both for worst car there, but still – I’ve never been a prize winner before! Bye bye BX. She’s off to a new home, but what will replace it? It’s always difficult to keep momentum up with big projects, but the new owner has showed great ability with an equally shambolic GS so I wish him well. There’s a huge myth that hydro-pneumatic Citroens are horribly complex. This is because an engine driven pump powers a hydraulic system that powers the steering, suspension and brakes. It runs at up to 2500psi, which is admittedly a bit scary, and it gives the BX the most powerful brakes of any family car of the 1980s. When you enter the world of the BX, you do need to learn all about height correctors, accumulators and suspension spheres but it’s all quite simple really. Ignore the suspension and you’ve got an incredibly simple machine. This has massive advantages, as I discovered yesterday after a weekend in Derbyshire. By the time I got to the East Midlands, there was a grumble coming from the engine bay. My bet was on alternator bearings and on the drive home, this was confirmed. By the time I got to Shrewsbury, it was really quite bad. I limped to some services – it’s nice to be able to choose where you’ll break down – and pondered what to do. My options were limited, due to a rather ridiculous lack of tools. I decided that the best course of action was to remove the alternator belt altogether, but how to remove it? Fortunately, I had a multi-tool with me and while it lacked a spanner of the correct size to adjust the alternator, it did have a small saw. So I cut the belt off. Easy! I still had over an hour of driving ahead of me, but a Citroen BX diesel uses very little in the way of electrickery as it drives along, so I reckoned I’d be alright. The fuel pump is mechanical and there are no computers controlling various aspects of the thing. In fact, the only reason voltage was needed was to keep the stop solenoid open (switching off the ignition shuts this, and therefore stops the engine) and to operate the lights and wiper. I was hoping to avoid rain entirely, but being Wales, didn’t entirely manage this. However, I did safely manage to get home. Phew! An option now is to rebuild the alternator, but I’ve managed to score a reconditioned replacement for £44 delivered on Ebay. I had to order a new belt as well of course, but the old one looked pretty ropey anyway. It was also clear to see that it had been slipping for some time. The pulleys had a very polished look! The BX coped very nicely otherwise, with another 300 mile trip. With new window seals fitted, it’s utterly transformed and barreling along at 60mph is very pleasant indeed. I’ve been struggling slightly with project motivation of late, but am now feeling more positive and ready to tackle the reducing To Do list. The best thing about owning a hydraulic Citroen – until they fitted Xantias with anti-sink valves – is the fact that you start the car, and it then majestically rises to driving height, rather like a hovercraft preparing for launch. I never tire of it. I do wonder why so few manufacturers went down this route though. For a glorious few decades, the likes of Audi, Mercedes-Benz and even Rolls-Royce licenced the technology for their own cars, though all used conventional springs with the Citroen-technology offering a smoother ride and self-levelling. For an estate car, self-levelling suspension seems something that no load-lugger should be without. After all, in theory, an estate should find itself hauling heavy stuff about from time to time. It’s kind of the point. 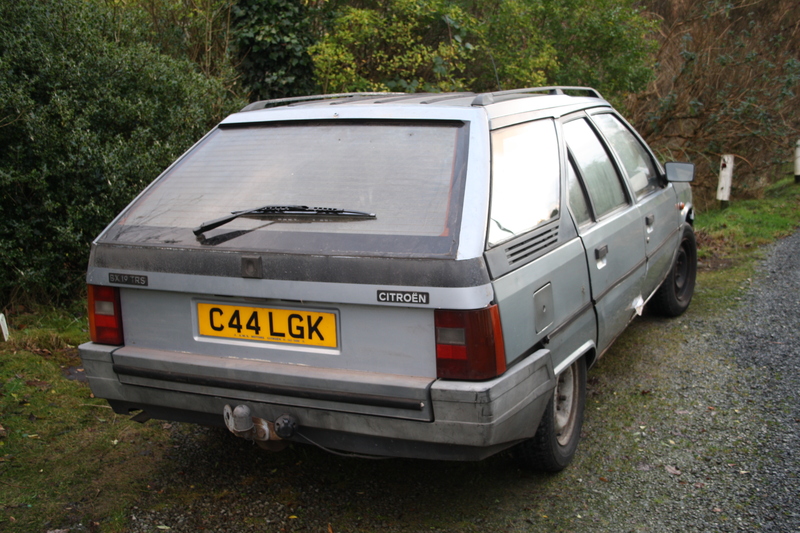 The BX makes an excellent estate, even though it’s actually a conversion carried out by coachbuilder Heuliez. The changes are restricted to an extension piece to increase the rear overhang, different rear wings and rear side windows and a plastic roof transformation piece. 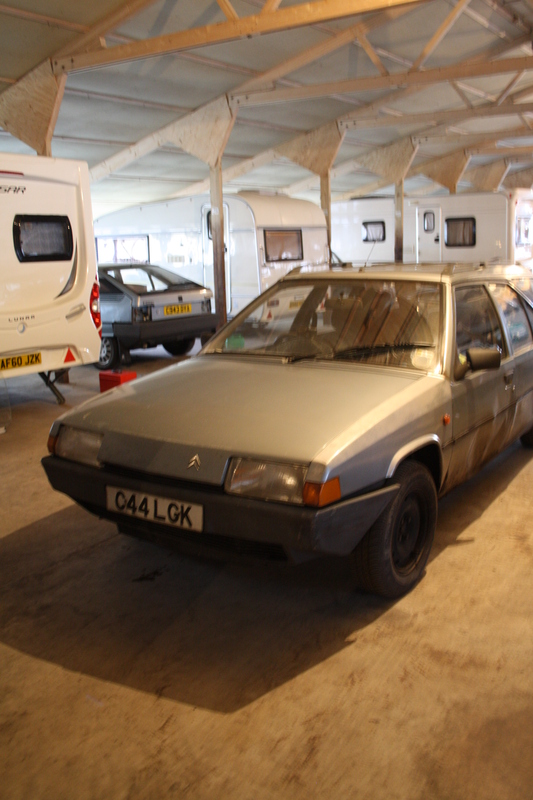 The seats, doors and basic bodyshell are all stock hatchback (or, confusingly saloon as it was officially called). The load space is very generous, and includes little eyelets for fixing down loads. Again, the hatchback load cover is extended, which means the estate has a hinged parcel shelf. Good for hiding stuff in the boot and much more effective than a flimsy, roll-up load cover. But the best element is that height-adjustable, self-levelling suspension. Place a heavy object in the rear and the height corrector will notice the drop in ride height, and cause the pump to push more pressure into the suspension loop. The rear end then rises to the correct height. Simple and exceedingly effective. The really clever bit comes from the rear brakes. These are supplied with pressure from the rear suspension units. If they’re under more pressure due to a heavy load, they’ll consequently give the rear brakes more pressure to boost stopping power. Genius! I put this technology to the test today, by loading the BX with a good quarter-ton of wood. There’s plenty of room for a builder’s sack full of wood and once the engine is started, the car easily rises up to normal height. It felt good and stable to drive as well, with little drop in performance – accelerating or stopping. There’s certainly no way that I’m going to stop grinning like a schoolboy every time I start the BX up. Few cars deliver this level of joy before a journey has even begun, and fewer still that can be bought for so little money! Enough with all this 4×4 talk. It has distracted me from the shed of dread. The BX hasn’t had an awful lot of use over the winter. It started running really badly, and the power steering became all intermittent with its assisting. Believe me, this makes cornering far more interesting than it should be! The running issues seem to have resolved themselves, though she’s still down on power. The power steering seems to have been remedied by changing the LHM and cleaning the filters. This is the lifeblood of the BX, so this is rather like refreshing the blood and clearing out the arteries. Seems to have done the trick, though some minor hydraulic issues remain. I needed to get to Derbyshire to collect some replacement doors and seats for the BX. I was worried about how I’d get there, but a long run the weekend before departure renewed my faith in the BX. Yes, it has its issues, but surely it wouldn’t let me down? Come the morning of departure and she let me down. The driver’s door latch froze open, so I couldn’t close the door. I didn’t really fancy trying to strip the mechanism down if it was cold enough to do that, so I decided to take my Ford Maverick. Mistake. While this at least got me off the driveway, after a few miles, it began misfiring and the brakes started making horrible noises. Back home I went. By now, the BX lock had unfrozen, so I decided to go in this after all, albeit now 2hrs later than planned. That was largely due to the need to de-ice the inside. Once free of ice, I was away. The power thing isn’t too much of a problem. Sure, acceleration is laughably slow, but then even a healthy 1.9 diesel BX can be embarrassed by modern turbo diesels. It didn’t want to pull beyond 3000rpm really, but that’s ok, as there’s a good spread of torque beneath this. Progress was still swift (or as swift as it can be on truck and tractor-heavy trunk roads in Wales) and when we eventually reached Shrewsbury and the novelty of dual carriageway, the BX just about managed to clock 70mph. I was bloody freezing though and a quick under-bonnet inspection revealed a top hose that was very much not warm. Looks like a new thermostat is needed then. At least the big climb out of Shrewsbury on the A5 got some heat into the engine – and the interior! My chilly state was not aided by door and window seals which are absolutely knackered. Ventilation was not an issue. Yet despite being far from healthy, the BX plodded on. The ride was still comfortable, the handling still excellent and the brakes absolutely superb. Few things stop like a hydraulic Citroen. Sadly, the impressive brakes were also creating a rather irritating chirrup at speed. I suspect one of the front calipers is binding, just enough to cause a squeak, but happily not enough to cause massive heat build up. Seized calipers can be dangerous. I arrived in Derbyshire at 2pm, five hours after I first attempted to leave the house. The capacious rear of the BX easily swallowed up a rear seat, two front seats and three doors gifted by a kindly fellow BX Club member. He’ll be putting better doors on his own Mk1 project. After (non)quality nosh from a greasy spoon (which was perfect to be honest!) I set off homeward at about half-past four. The next three hours were pretty tedious, and dark. The only dashboard illumination that actually works on the BX is, usefully, the speedometer – a rotating drum that makes me smile every time I look at it. How Citroen to have the numbers move! The main beam is operated by clicking the left-hand ‘pod’ at the side of the steering wheel. Seems odd, but works very well. If you’d spent all day leading a 2CV convoy around some of the nicer parts of Wales, you’d probably like nothing more than to curl up on the sofa with a cup of tea, enjoying the heat from a roaring fire. Bliss. Instead, last night I found myself standing around outside acting as assistant to my mate Mat while he made a brave attempt to cure some of the BX’s many problems. First was an attempt to reseat the hydraulic pressure regulator’s ball bearing, which was possibly to blame for a low tick time – the amount of time between pump runs. A healthy hydraulic Citroen can maintain pressure for at least 30 seconds before the pump needs to cut in and re-pressurise the system. Mine has been cutting in every second or so, despite a new accumulator sphere. This may all sound like gobbledegook, but it’s simpler than it sounds! As it happens, while we thought there had been some success, it doesn’t seem to have made any difference at all. The power steering is also still intermittent, so suspicion is that it is either a weak pump, or blocked filters in the LHM reservoir. If I’m feeling brave, I may yet nip out and have a go at sorting that out! It’s still very cold outside, if less dark. Next task was to replace two more glow plugs. I hurriedly changed a pair before it went in for welding work, but ran out of time to change the two trickiest ones. It’s an annoying job as lots of things get in the way. Some plugs can be removed with a socket, but one needs a spanner. Quickly sorted though, and starting is improved. Then the wiper motor assembly was replaced due to horrific wear in the one fitted. The replacement isn’t perfect, but it is far better. You need good wipers in Wales. Finally, we tackled the tailgate wiring, as it had not been reconnected following the welding work due to lack of time. The number plates and central locking now work, but eventually we had to concede that warmth and food were a good idea, so the heated rear window and rear wiper will have to wait for another (hopefully warmer!) time. Today, I’ve been tackling various issues that the 2CV and Peugeot 309 have developed. The latter now has an improved exhaust system while the 2CV has a temporary replacement ignition barrel – courtesy of a Dyane – and a cleaner roof. I’m hoping for another dry day tomorrow so I can water-proof it… You have to get your tinkering in while the weather is dry, by day or night! The trickiest thing with any project is maintaining momentum. How often do you see the immortal words “unfinished restoration” accompanying a classified advert? Keeping a positive frame of mind can be very difficult, especially when tackling bodywork. What seemed achievable when the car was complete may seem horrifically daunting once you start digging into the structure and discovering just how rampant the rot is. Mechanical overhauls can be a challenge too. You fix one thing and immediately, something else goes wrong. 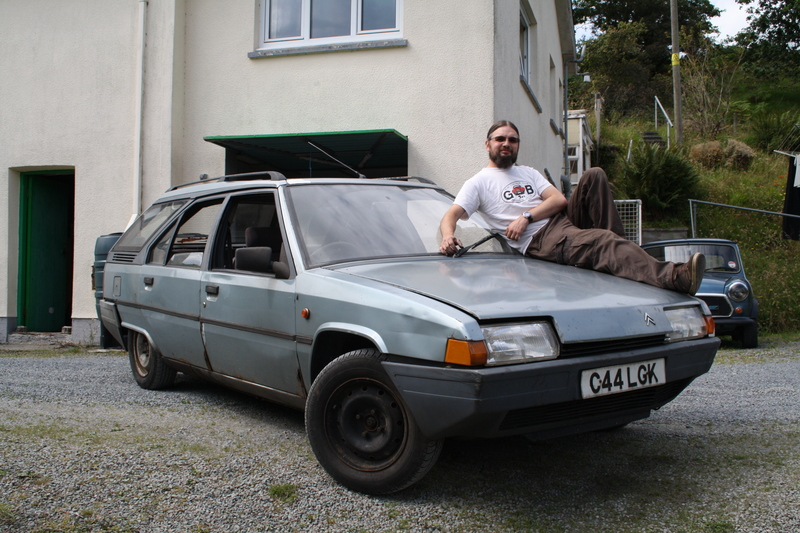 I thought that tackling my Citroen BX Mk1 project as a rolling restoration was the way to go. I therefore focussed on getting it back on the road as a first step. It didn’t have significant corrosion in key areas and seemed mechanically able. It was still pleasing that it did get an MOT pass. Hoorah! However, I now wonder whether I’ve shot the gun so to speak. Yes, it may be on the road but it has so many minor issues that perhaps it shouldn’t be. Would it not have been better to work through some more of these problems first? That’s how it feels at the moment as while I can drive the car, I get little pleasure from doing so. The engine is down on power, the hydraulics are not working entirely as they should, the windscreen wiper mechanism is so worn that the bodywork gets wiped/thumped, the front passenger door doesn’t really want to open, the heater doesn’t work apart from on its fastest setting, the indicator relay is a bit slow and ideally needs replacing, the rear wiper/HRW are not connected up and three of the tyres have slow punctures. I could go on but I won’t for fear of putting myself into a depression. The problem is, I love driving and a properly sorted BX – even a 1.9 non-turbo diesel – is a joy to drive. Mine just isn’t and getting the problems sorted seems at this stage both difficult and expensive. This is when project motivation can begin to stall. The end cannot be seen and it all starts to feel rather futile. With this one, there’s the added element of rarity. Sometimes that’s a pressure I don’t enjoy at all. Oddly, I always seem to feel low just after a major milestone has been achieved. Perhaps that’s because while there’s celebration for one small task completed, there are so many more that need sorting!